The 1940s (“Golden Age”) version, and thus the original. The “Silver Age” (scare quotes) version, which is the most obscure of the three and will be discussed here. The modern-days version of Giganta. The “Silver Age” version appears in 1966-67, as written by my eternal nemesis the accursed Robert Kanigher. The scare quotes are because it was a peculiar era for the book. Called the “new old” era in letter pages, it was a return to the 1940s characters and story elements but with DC’s kitsch 1960s sensibility. Whether the “new old” material belongs to any known continuity can be answered in one word – fnord . Group Affiliation: Agent of Dr. Psycho. Height: About 11’ Weight: About 500 lbs. Giganta is… well, a giantess, and is superhumanly strong and agile. For instance she could jump on top of elevated electrical cables and start running on one of the wires without any problem. She could even fight on one while holding Trevor with her left arm. She wasn’t strong enough to really hurt Wonder Woman, but could bash and daze her. She still understands the social customs of gorillas (or at least Kanigher’s version of such), but also mysteriously knows how to speak, read and write English and operate in modern society. Giganta was originally a female gorilla held at the city zoo. She sported both an unusual size and super-simian strength. In 1966, whilst Diana Prince and Steve Trevor were at the zoo, Dr. Psycho telepathically convinced the ape that she wanted Steve Trevor for herself. 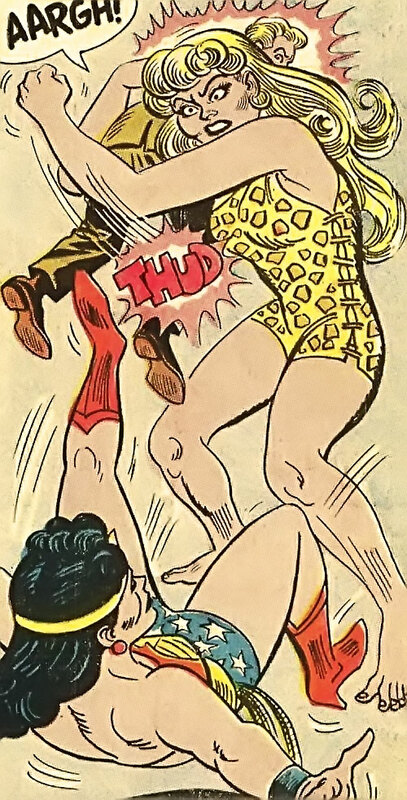 Giganta grabbed Trevor, but was soon subdued by Wonder Woman. One Professor Zool seized the moment to pitch his idea about evolution experiments to the zoo management. He already had done so repeatedly, and once again he was turned down and forbidden from using the animals for experiments. But Dr. Psycho overheard Zool. Psycho kidnapped the gorilla that night, and had her brought to Prof. Zool’s place. The villain’s thugs forced the professor to use his evolution machine on the gorilla, with Psycho also using his telepathy on the ape. The animal thus turned into a very tall and powerful woman (somehow dressed with a panther-print bathing suit and earrings, and fluent in English). 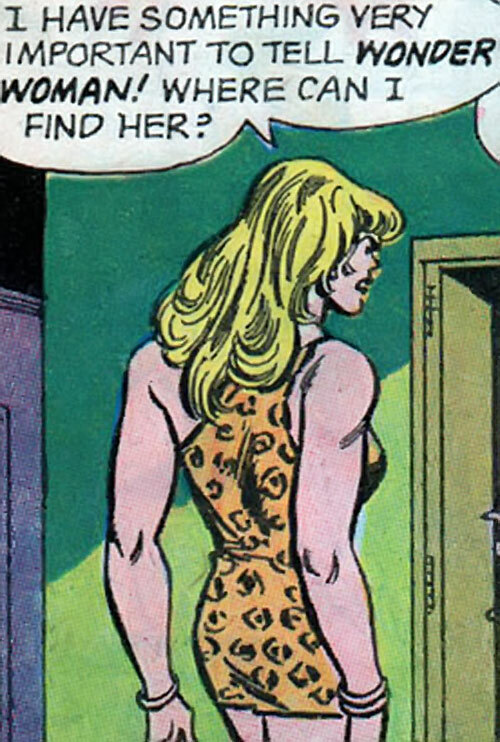 As per Psycho’s previous conditioning, she still wanted to find Steve Trevor. Now an agent of Psycho, Giganta ambushed WW and Trevor. It didn’t work and Wonder Woman flew Giganta to Paradise Island in her invisible plane, for rehabilitation. 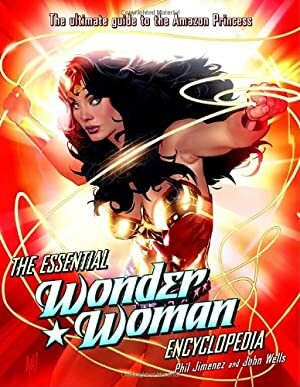 The following year, the Collector contacted three Wonder Woman villains to steal the Amazon’s magic lasso – Paula von Gunta (this era’s version of von Gunther), Psycho-Man (Silver Age version) and Giganta. How Giganta escaped from Paradise Island was not revealed. Not being the smartest of the three, Giganta just looked up Diana Prince in the phone book. She then came to her place and demanded to meet with Wonder Woman. Told that WW was sunning herself on the roof, she got there and grabbed the Amazon, spinning her hard. 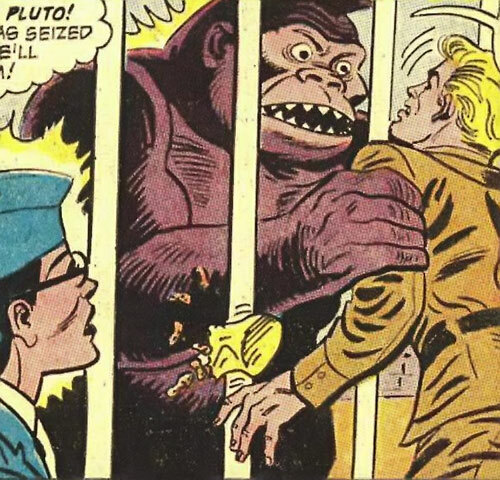 Giganta was swiftly defeated and arrested. This version of the character was never seen again. At least the change in hair colour makes it easier to tell the versions apart. She’s still a gorilla, really. Thanks to Dr. Psycho she’s obsessed with Steve Trevor. She wants to grab him, kill Wonder Woman and then force Trevor to love her since his previous love is now dead. This is the most elaborate plan she’s likely to come up with. Giganta tends to rub her (wet) nose against other peoples’s to express satisfaction. She makes many, many references to tropical fruits in her dialogue. Apparently, she also came to like money. 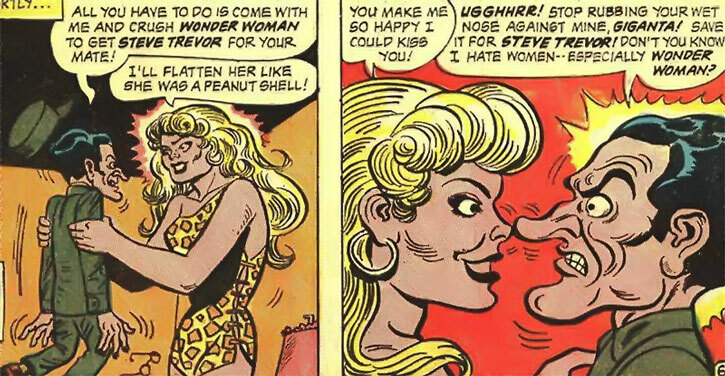 Were I Robert Kanigher, I’d certainly point out she doesn’t work for peanuts ! – Stature — Growth 2 (Permanent), Enhanced Strength 1 (Limited – Only For Lifting), Enhanced Presence 1. – Sheer mass — Enhanced Impervious Fortitude 2. – Strong gams — Leaping 2. – Long arms — Improved Grab. – Graspy toes — Second chance (retaining her balance on narrow surfaces). All-Out Attack, Close Attack 6, Defensive Roll 3, Improved Grab. Second chance (retaining her balance on narrow surfaces). Acrobatics 6 (+11), Athletics 1 (+14), Deception 1 (+2), Expertise (Gorilla lore) 6 (+4), Expertise (Jungle survival) 4 (+2), Intimidation 0 (+2), Perception 3 (+3). You big ape Psychologically, Giganta is still a 1950s comic book gorilla. 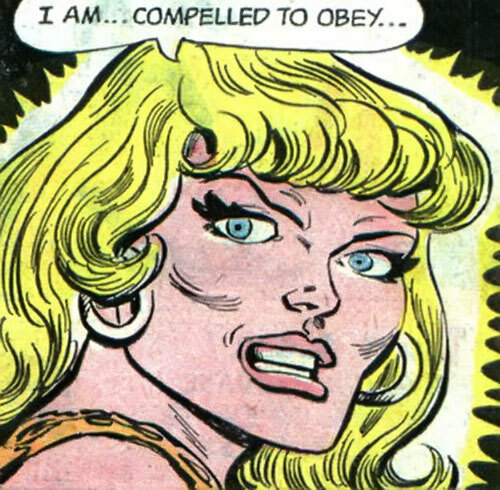 Powerful right ook Giganta has little cunning and will almost always take the simplest, most direct (and usually forceful) approach. Get Trevor Giganta is under a mesmeric compulsion to make Steve Trevor hers. Trade-off areas. Attack/Effect PL 13, Dodge/Toughness PL 12, Parry/Toughness PL 12, Fort/Will PL 7. Points total 105. Abilities 56, Defences 18, Skills 11, Powers 15, Devices 0, Advantages 1. Equiv. PL 7. If using the uncapped scale, drop the Limitation on her Enhanced Strength Rank, which raises her to 14. Note that on the normal DCA scale, where the higher scores are squished, this version of Giganta has scores that are closer to Wonder Woman’s than on an uncapped scale. This makes her more dangerous to the Amazing Amazon. Source of Character: Pre-Crisis DC Universe.